An economical and hardwearing luggage tag that will withstand the toughest conditions. Can be personalised with your corporate details. 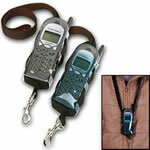 Plastic transparent phone carry case ideal for exhibitions includes lanyard and identity hook. Can be personalised with your corporate details. Mobile phone holder with cord. Available in a selection of colours. A cost effective way of displaying your promotional message. Key wallet with zipper. Available in a selection of colours and can be personalised with your company details. Wallet with various compartments available in a choice of colours which can be personalised with your promotional message. Wallet with credit card section and various compartments. A very useful promotional gift that can carry your company details over an extended period. Travel Shoe Polish set which can be discreetly personalised with your company details. Luxor soft leather travel organiser, zipped multi-pocketed wallet with indexed compartments. Can be personalised with your corporate details. Zipped travel wallet with a multitude of credit and ticket pockets in durable soft Koskin material. An ideal promotional gift. Travel Wallet with various compartments and zip fastening. Spread your promotional message worldwide. Sewing Set with mirror which can be personalised with your promotional message. A business gift that will be appreciated. Sewing Kit with mirror. An attractive business gift that can be personalised with your promotional message. Multifunctional adapter for international use. Personalise with your corporate details and give your client this very useful gift. Luxury Metal Luggage Tag which can be personalised with your corporate details. Modern designed Luggage Tag which can carry your promotional message far and wide. Matt finish quality aluminium luggage tag with generous personalisation area to display your promotional message. Metal luggage tag with hidden address label. A quality business gift that will be well appreciated by your clients. Aluminium luggage tag, stick on address-label. A useful promotional item which can be personalised with your company details. Quality Personal Care set incl. Tooth-brush, nailclippers, nailfile, tweezers, scissors and shoehorn. Price includes personalisation.